St. Eugene was born in 1782 in France to a family of nobility. As a result of the tumultuous social and political events following the French Revolution, he was forced to flee with his family to Italy, where he lived for several years. His family life was far from ideal. His mother was a commoner, but her family had money. His father, on the other hand, was descended from French nobility, but his family had lost most of their money. The couple’s very different backgrounds created tension in the marriage and they would eventually divorce, a rarity for Catholics in the eighteenth century. After eleven years in Italy, Eugene returned to a France that was dramatically changed. He was now a common citizen with no nobility status. Amid boredom and depression he longed for a real purpose in life. Eugene experienced a religious conversion to the crucified Christ and entered the seminary at St. Sulpice, Paris, in 1808. Upon his ordination as a priest in 1811, he felt called to address the urgent needs of the Church, in particular, the poor and downtrodden peasants of rural Provence. 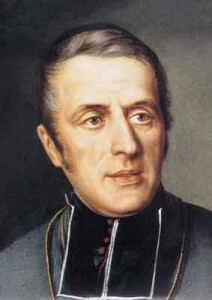 In 1818, the young de Mazenod received permission to found a congregation which embodied his love for the poor and his zeal for the mission of evangelization. Pope Leo XII officially approved the congregation, the Missionary Oblates of Mary Immaculate, on February 17, 1826. Later, in 1837, St. Eugene was made Bishop of Marseilles. He worked tirelessly for the Church of his diocese while sending his Oblate missionaries all over the world, including the United States, in response to the requests of foreign bishops. Eugene de Mazenod died at Marseilles on May 21, 1861, and was canonized in 1995 by Pope John Paul II. His feast day is celebrated on May 21.